I'm building a second reprap, and was interested in trying different things, so was contemplating using a "direct drive extruder"
Has anyone had any problems with using this sort of drive? From a mechanical point of view, it looks like there will be far less precision using this, than using the Wade extruder, where the drive train from the stepper motor to the filament is via the 2 herringbone cogs, which must give 20 to 1 reduction, followed by the quite small diameter of the hobbed bolt. By comparison the "Direct drive" just has the "drive gear" which looks to have twice the circumference to the hobbed bolt. So overall, it looks like the stepper will need to turn around 40 times slower than with the Wade extruder. This seems like a large difference in the two approaches, and I can't quite see how the stepper motor has the precision to do this. - Unless the Wade Extruder approach was completely over-engineered in the first place. I understand that the Wade Extruder was probably initially designed for 3mm filament rather than 1.75mm, hence the volume of the filament is around 3 times lower in 1.75 mm filament to that of 3mm filament, but this is still no where near the mechanical differences between direct drive and Wade. Can anyone advise about whether its worth trying direct drive? Edited 1 time(s). Last edit at 11/02/2013 08:47PM by rogerclark. I've wondered this as well, though they seem to be becoming more popular. My worry has always been whether or not there would be sufficient torque, as one loses all the mechanical advantage of the gearing. Perhaps with 1.75mm filament it is less of an issue. I would like to try a belt drive extruder at some point, as I think they would be more precise than one with printed gears. There has been a move towards proper belt pulleys, instead of printed pulleys, as they are more precise, so I would think the same logic would apply to an extruder. I use both wades and direct and have no real issues with any. What's worth noting with the direct drive is that the torque (as mentioned above) can be a problem. You need a very good hotend that has no problems extracting plastic with low force. I use direct drives on a couple of Prusa i3's with a bowden setup and it works fine. With the wades you will "never" run out of torque. You will strip the filament before the motor stalls. Quality of parts? Bowden setup well will produce very nice parts but it is harder to get to work properly then a extruder setup on you x-carriage. It's one of those things you probably need to test/try for yourself to actually make up your mind of which one to use. If a small, light and powerful stepper was available at low cost it would probably be good as a direct drive with multiple extruders to make the overall footprint smaller. As precision goes I don't think that is an issue. Backlash with gears is fixed by using herringbone gears, well I can't see any noticeable backlash using them. But you need a good setup printer to print them properly. yes. It would be good to hear any experiences of these. I guess all those Makerbot users must be OK with them - but it does appear that many Makerbot's need to be upgraded with modified direct drive extruders. I forgot to mention, my other worry with direct drive, is that a lot of lateral load is placed on the bearings in the stepper motors, where as the Wade extruder has bearings either side of the filament, which seems a much better design. I've just ordered a load of closed loop belts for my next experimental reprap, so I could try to make a belt driven extruder if I could find a GT2 pulley that has a lot of teeth e.g. 100 teeth, but I don't know if any of these are made. Interesting to hear that its hot end dependent. I never thought about the lateral load in this application, but you are right. I subject my axis motors to very high belt tension, and I can see the shaft flexing. I bought some bearings with a 5mm ID that I've been meaning to use to help support the motor shaft, and I suppose that the same thing could be done for an extruder drive. According to this blog post: [airtripper.com], only about 2kg of force is required to push 1.75mm PLA filament through a 0.4mm nozzle. Direct drive on a NEMA 17 with a standard 11mm hobbed pulley would generate close to 10 kg of force at the filament, which would be plenty for extrusion. Using a wade's extruder (especially with the much smaller diameter hobbed bolt) gives nearly 40 kg of force on the filament! This is definitely not necessary for 1.75mm filament. It also drastically limits your top retraction speed, which is bad for bowden setups. NEMA stepper motors have 5mm ball bearings at each end so adding an external one is not going to make a massive difference. I have never noticed any play develop even on motors that have been used continuously for years. 1.75mm filament is about 3 times easier to push and the Wades gearing is about 3: 1 so you definitely don't want gears with 1.75mm. The herringbone gears really reduce slop. I've had good results even with the Eckertech extruder which uses a smaller gear than the Wades. Both strip the filament before anything else fails if something plugs up the nozzle. This is all with 3 mm filament ABS which is harder to strip than PLA. That leads me to suspect that the Wades is good, but just overbuilt for the job. Dropping to 1.75 mm would really add to the Wades being overbuilt for the job! If you are designing an extruder, you want it to fail by stripping filament. Up to the point the filament gives way, it's still trying to push stuff through the hot end. There is / can be / may be all sorts of crud in filament. You very much want to push it out the extruder if you can. The force required is going to go up as the feed rate increases. How fast do you want to shoot filament? The force required is a minimum at some temperature. Is that where everything else works right for you? None of that says that you can't do a very good direct drive extruder. All it really says is that you may want more force than the minimum required. What I am concerned about is motor shaft flex, since the pulley is not supported on both ends. My belts are tight enough that the shafts do flex, and an outboard bearing on the other side of the pulley should eliminate this. I agree that the load on the actual bearings is likely not a problem, as this is the type of load that they are designed for. I've started looking at this recently. Does the use of a geared stepper fix the torque problem? The real question on that motor is weather the gears are plastic or metal. If they are plastic, I'd bet it will only do those ratings for a while. It's a low torque NEMA-17 geared down 5:1. They have a "high torque" NEMA-17 that will do 1/2 the output of the gear box unit for < 1/2 the price. I've bought some 43mm (high torque) NEMA 17's for testing, but I've noticed that I have to turn the trim pot on the stepper driver, nearly to full in order for them to work. So I'm not sure if this is going to be a viable option. (My supplier's literature claims they are tested with RAMPS, but to be honest I'm very skeptical about these claims, and suspect that they just buy them in bulk from AliExpress and then sell them individually at a small markup - without ever testing them. They offer a money back guarantee for motors that don't work with RAMPS, but the cost to send a motor back is probably 1/2 the price of the motor its self. There is a separate thread on the forum for the 2nd of these, which @Vince has bought, so I'm hoping he can give us all a review. Edited 1 time(s). Last edit at 11/08/2013 06:22PM by rogerclark. A "normal torque" NEMA-17 should be within 20% to 30% of their high torque version, so it's nothing special. The 1.5A current is a bit much for the drivers we use. There are a *lot* of motors out there with that issue. The second pre-built extruder runs a type K thermocouple for it's sensor. That's going to be a bit tough to run into your Ramps board. If it's anything like the thermocouple's I've bought on eBay it's not going to be very accurate. I have yet to get one back from the cal lab with a clean bill of health. I didn't notice the thermocouple. I've looked at using these before, for a non-reprap project, and it looks like they'd need a special converter board for use with RAMPS. Edited 1 time(s). Last edit at 11/08/2013 07:35PM by rogerclark. I've "messaged" two eBay suppliers to see if either of them know if the thermocouple can easily be removed and replaced. I'll let the forum know if I get any responses. I'm not sure who'd want to use these as they stand. Perhaps some other printers use thermocouples ?? Edited 1 time(s). Last edit at 11/08/2013 09:26PM by rogerclark. 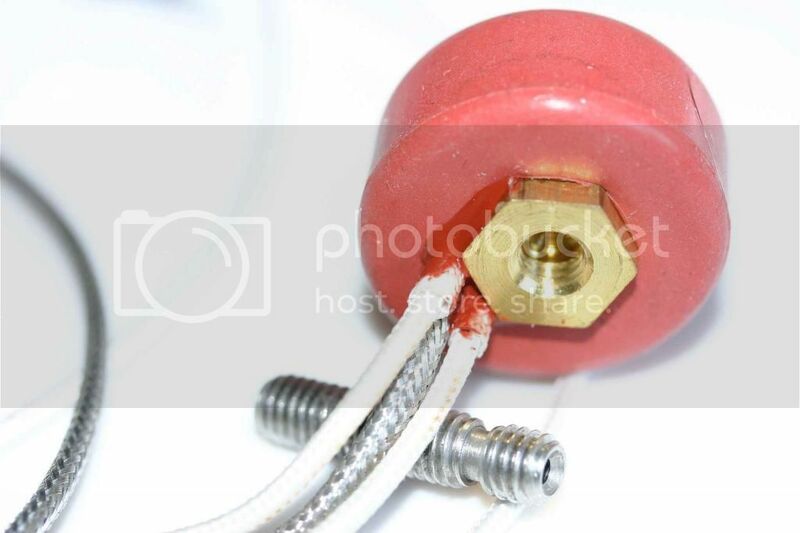 Roger, I dont think it would be easy to remove the thermocouple out of the one I have but there is probably enough room in the brass to drill a small hole and fit a thermister. Im regretting getting this thing. I thought it would be ready to drop in but the stepper drive may be weak and the temp sensor is probably wrong. would do the trick. There are lots of alternatives. I don't know what the goop around the body of the heated section is. It would be interesting to know how well it stands up to 230 or 250 C type temperatures. Same question about what I'd hope is a high temp o-ring on the nozzle. If any of you googled RepRap thermocouple you would find the RepRap thermocouple expansion board (first google result) or you could post this technical question in one of the forum sections for technical questions and get an answer a lot easier than posting the question in the forum section about "People building or using RepRaps" which is called RepRappers (a person that uses a reprap) and has a subject line that reads "People building or using RepRaps". Edited 1 time(s). Last edit at 11/09/2013 12:44PM by Sublime. ..... which (oddly enough) ultimately leads you to the board with the AD595 on it. I wonder what these extruders where originally built to go into. i.e I can't imagine that some just decided to manufacture them and didn't investigate whether a thermistor or a thermocouple was the correct sensor for their target market. The eBay sellers must be getting them them from somewhere. I look a look on AliExpress, and they had similar items, but still no indication of the real target market for these extruders. I'm not sure if its possible to tell if its going to be powerfull enough, unless you can fire it up and get the motor to push some filament though it. Looks like AD595 are relatively expensive at round $15 plus postage..
Digging out the goo and putting in a thermistor still looks like a better option based on the 2 photos than Vince posted. Edited 1 time(s). Last edit at 11/09/2013 04:34PM by rogerclark. I wonder how they make thermocouples that don't work correctly? How hard can it be to spot weld or silver solder the two leads of the correct wire together? Unless they are using the wrong thermocouple wire to start with. I have a *lot* of examples of them not making a thermocouple correctly. If you want to see a few dozen, drop by and I'll show you the thermocouples and the cal lab reports on them. My *guess* is that it's a thermocouple that is close to a K at some specific temperature. It's designed for a cut out or something like that. They use an alloy for the wires that's cheaper to make than the "normal" K type wire. Another guess is that it's not a K at all, they (the sellers) are confused about thermocouple tables. Either way, apparently it's not that easy a thing to get right. Not in any way relavant, but if you are going to make thermocouples, welding the leads is a much better approach than soldering them. Edited 1 time(s). Last edit at 11/09/2013 07:11PM by uncle_bob. Well I have my Ebay extruder working OK(ish). I drilled out a 1.5mm hole in the brass body and inserted a thermister. It takes a little longer than my J head to get to temp but there is no smoke or flames and will go well over 240 if required. Im using it with 1.75mm filamant and if I try to stop it pulling through there is lots of extra torque available. I currently dont have its cooling fan wired up. The nozzle is .3mm. On object walls its almost impossible to see the layers, also the interlayer adhesion is exellant. What is not so good is flat surfaces and vertical holes. There is a lot of 'smudging' going on which looks like over-extruding but is still there if I turn the flow right down..
Im guessing it may be due to the wide nozzle end (compared to hole dia and layer thickness). 2mm vertical holes will mostly get filled my the smudging. Perhaps the wide flat nozzle base is spreading out the ABS, giving nice walls and good bonding but poor flat surfaces. I will try to shape the nozzle end today and see it it improves. where the motor holding torque is expressed in Nm. The motor torque is the value before any gearing. The steps/mm takes account of both the gear ratio (if any) and the hobbed bolt diameter. The formula assumes 16x microstepping. Below 5500, there is likely to be too little torque and the motor will skip steps unless you extrude slowly or at a high temperature. Much above 9000, if the nozzle becomes temporarily obstructed, the extruder will grind through the filament instead of skipping steps, causing it to lose traction even when the obstruction is removed. Depending on the hobbed bolt design, it may be possible to exceed the 9000 value and have the extruder skip steps before it grinds the filament. In practice, this means that the optimum gear ratio when using a Nema 17 motor is about 3:1. This allows the use of short (34mm) motors. Using a higher gear ratio is possible, but may unduly limit the available acceleration. For direct drive extruders using Nema 17 motors, you need to use a long (e.g. 48mm) motor running at 80% or so if its rated current, with the hobbed bolt diameter only slightly greater than the motor shaft diameter, assuming a 5mm shaft. Edited 4 time(s). Last edit at 07/18/2015 01:11PM by dc42. What I read from this is: It does make a difference using a 1.6A stepper at 0.3A instead of using a 0.4A stepper at the same current setting? If this assumption doesn´t apply automatically, would it make sense to select the stepper with the best holding torque / max. amp ratio? Unfortunately, I don´t have any datasheet of my steppers. It´s time for a weightlifting test, also to find out which influence the microstepping really has on torque.